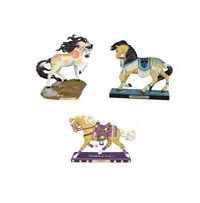 Winter 2019 Set of 3 Figurines | Painted Ponies Everyday Figurines | One Price Low Flat Shipping! From the Trail of Painted Ponies Winter 2019 Release, Set of 3 Winter 2019 Collectible Horse Figurines. Each is made of hand-painted resin and come in collectible box with story card.